Wed., June 14, 2017, 5:54 p.m.
RENTON, Wash. – Richard Sherman said Wednesday he never asked for a trade from the Seattle Seahawks, but understood why the only team he’s played for was listening to offers for his services. In his first news conference since the end of last season, Sherman addressed a variety of issues, from the trade rumors that hung over Seattle’s offseason to a report that indicated he was at the center of locker room discontent stemming from the Super Bowl loss to New England, to his conduct during parts of a tumultuous 2016 season. For now, Sherman seems to have repaired any rifts that lingered from the talk of a possible trade, his conduct at times last year or the ESPN report which also questioned his relationship with quarterback Russell Wilson. Teammates Bobby Wagner, Doug Baldwin and Michael Bennett stood by as Sherman took questions for nearly 20 minutes after Seattle wrapped up the second of its minicamp practices. As for his relationship with Wilson, Sherman said there is respect in the locker room for their quarterback, especially for how he played last year while dealing with serious knee and ankle injuries. Sherman has spent his entire career in Seattle, developing from an overlooked fifth-round pick into one of the top cornerbacks in the NFL. He is due $11.4 million in guaranteed salary for the 2017 season and his current contract expires after the 2018 season. Sherman’s future hung over the Seahawks for a big chunk of the spring after general manager John Schneider first acknowledged in March that the club had trade discussions with other teams regarding the outspoken star cornerback. Those discussions came after a season during which some of Sherman’s actions seemed to take precedence over his play on the field. 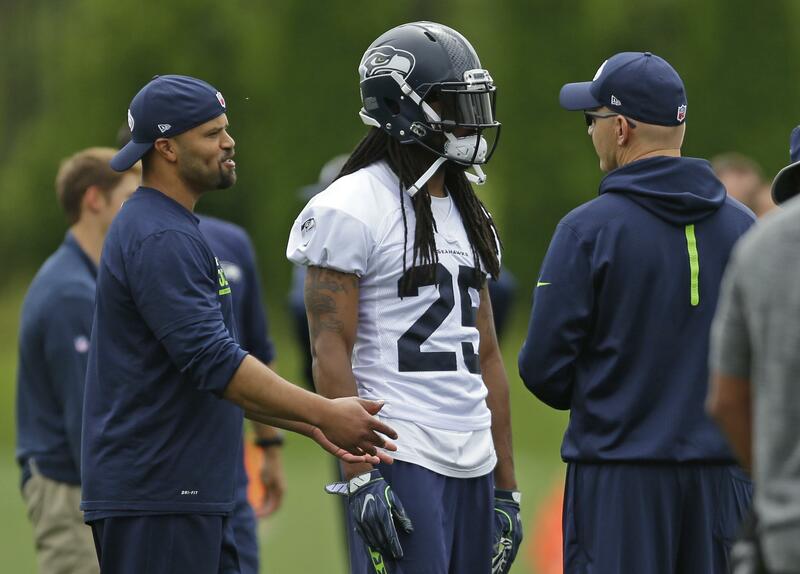 Sherman didn’t outright apologize Wednesday for his actions last season when he erupted on the sideline at both defensive coordinator Kris Richard and offensive coordinator Darrell Bevell, but he did admit he may have gone too far. During the offseason, coach Pete Carroll said he thought Sherman’s issues last season were self-inflicted. Published: June 14, 2017, 5:54 p.m.